On March 23rd 2017, Wester Ross Marine Protected Area will have it’s first birthday! 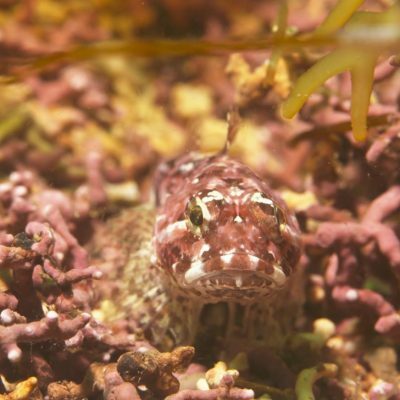 The network of MPAs are an historic turning point in Scotland – representing hope for our fragile blue planet, at least in this small corner of the world. Yet our ocean ecosystem is still under threat and the question Sea Change grapples with is how can we make the network of MPAs, the start of real change? Will we and our politicians choose to grab the day? 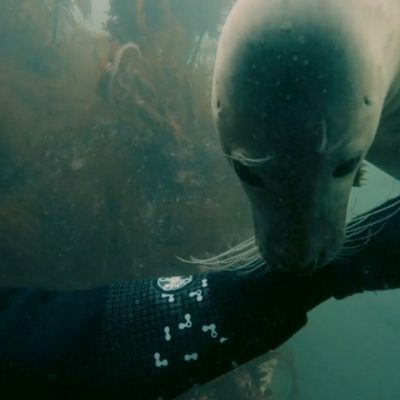 In my last blog I expressed the desire for more Jacques Cousteau’s in the world – divers, film makers and scientist or fishermen who can be storytellers, bringing the oceans to life for children, adults or yes, even the politicians! In the 60’s and 70’s Jacques Cousteau made the exploration of the oceans as cool as rock’n’roll. Sea Change hopes to make marine discovery as fun and exciting as it was then, but with the luxury of 21st Century technology. Sea Change invited a few Seasearch divers up to the Summer Isles Archipelago recently to discuss our survey plans. We chatted over cups of tea whilst wild white horses raced across the bay a few meters away. On the 1st day of the MPA my neighbour and I had wandered down to the shoreline of this bay to absorb the moment. Across the water we saw what I believe was a middle aged male Humpback Whale. It was almost as if it had come to mark the moment of creation with us. It was an important moment for me, even if siting a whale nearby is always a combination of excitement and anxiety – as with so many creels around there is always the risk of entanglement. 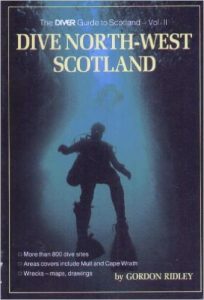 As we talked I learnt about the fascinating history of dives in Wester Ross. The Seasearch divers Neil and George had been diving the Summer Isles, which are at the heart of the Wester Ross Marine Protected Area, since the 1970’s. This was before the 3 Mile limit was lifted so in those days the inshore waters were protected from dredgers and trawlers – so it would have been largely intact even if many of the fisheries were already in rapid decline, the seabed would have been intact. It was considered a prime destination for divers and scientists at that time with famously clear water. George told me these first dives were carried out mostly between 1976 and 1979. In the summer of 1979 an expedition was mounted by Professor Davy Jones from Bangor University. During one of the dives on Tanera Beg they discovered a surge cave with the walls alive with a varieties of anenomes. They originally jokingly named it Davy Jones’s Locker but to honour the “Year of Underwater Conservation” which was in 1976, they renamed it Conservation or Cathedral Cave, as it is known to this day. The expedition mounted in the Summer of 1979 in which George and Neil both dived, was mainly a Nudibranch expedition (looking for sea slugs) around Tanera Mor. They found many undocumented species which I believe are recorded on slides held by Nigel Mather in the Herriot Watt University Archive and with Prof Davy Jones himself. 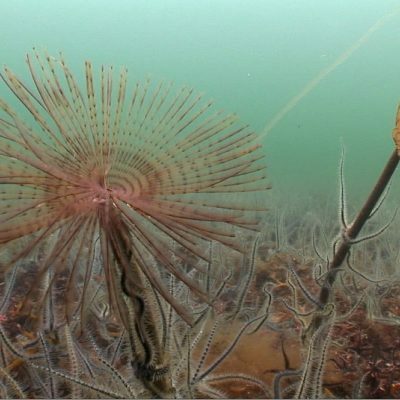 The divers also discovered wonderful plumose anemones at the north tip of the Anchorage bay ( Metridium point ) and Northern sea fans at Twelve Foot Rock. I believe that as well as slides there is also cine footage of these dives as Prof Davy Jones was an early experimenters with submarine super 8 cameras. So experimental, that according to George one camera exploded under pressure and they were lucky not to be hurt by flying fragments of pressurised glass. Gordon Ridley was a giant of Scottish diving and authored the Dive Scotland Guides (Dive North West Scotland ) recording some of the most stunning dive locations in the UK, some of which are up there with the best in the world. Parts of the Wester Ross MPA must qualify as a German diver flies over every year just to dive in Little Loch Broom). I am told Gordon Ridley, in the mid 70’s discovered species of sea snails in Wester Ross which had never been discovered before. (He also took slides but died 5 years ago so we hope these were kept.) George and Neil the Seasearch divers worked with him and they report that in their dive around Tanera Mor in 1979 they found some of the most rare sea slugs in Britain. I believe they recorded 107 species. It was around this time that prawns were just starting to become a viable creel fishery on the west coast with a growing European market replacing a fading Salmon fishery. Prawn trawling and scallop dredging were a decade or so away, as was the removal of the 3 Mile Limit. How magical it would be to have seen the waters before the real damage was done to the sea bed by this mobile gear. The 70’s must have been the very first dive explorations in the Summer Isles Archipelago, so it is a unique privilege for members of Sea Change to be able to meet these divers as well as a huge bonus that they are prepared to help us survey some aspects of the MPA. It would be wonderful to record, on film, their experience of these dives and perhaps, with luck, dig out some of these slides. With such a rapidly shifting baseline, and only a few elders who remember the abundance of old, it would be revealing to compare how the sea looked back then. Seasearch is a project for volunteer sports divers who want to identify what they are seeing in order to help protect the marine environment. 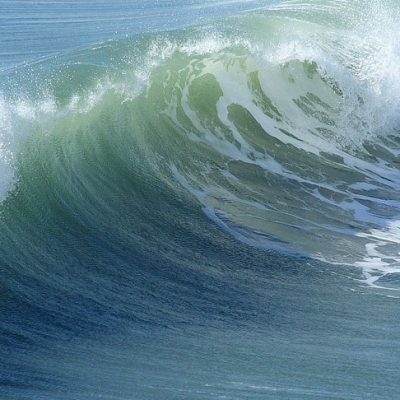 The organisation’s aim is to map the various types of sea bed around the shallow parts of Britain and Ireland. This helps identify the most bio-diverse habitats and what is most vulnerable. I am told the Underwater Conservation Year started the Underwater Conservation Society which became the Marine Conservation Society’s Seasearch network in the mid 1980s. The Seasearch team has done a wonderful job of encouraging divers to document the sea and share the knowledge they acquire by virtue of their sport, but what of the scallop divers? These men (and possibly women) dive every day, as they search the nooks and crannies of our coasts for places that have not been dredged. All the time recording in their own memories where species are – as well as were they were, and are no longer. If these scallop diver and sea search divers could pool their information – it would be a tremendous help to coastal communities trying, against the odds sometimes, to find the spare time and cash to pin down the evidence to know how to protect and restore the coastal areas. Wester Ross was considered a prime destination for divers and scientists in the 1970s with famously clear water. It is Sea Change’s aim to make it that again. As some indication of the possibility of further discovery – during Sea Change’s August survey we believe (still unverified) that we discovered an unknown maerl bed, but the scallop divers who support Sea Change plotted many more, potentially undiscovered maerl beds, on the MPA charts. We have not been able to check these yet. 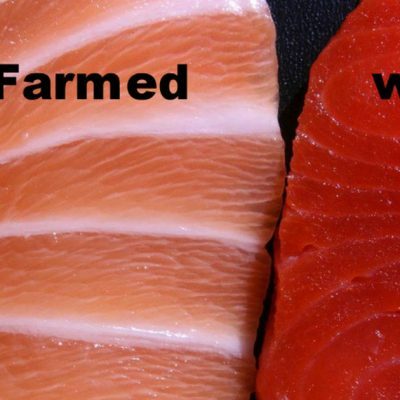 We should be using the fishermen’s knowledge much more. This is one of Sea Change’s core aims. We want to help connect fishermen, scientists, divers and the community to share knowledge in order to make better decisions that serve the wider public and coastal communities. After all the MPA was designated on the basis of quite fragmented knowledge of the ecosystem and species within the MPA. There is an exciting process of discovery ahead. Our talk moved on and to my delight I discovered Jacques Cousteau’s son had been to Reiff looking for whales. Reiff overlooks the Summer Isles Archipelago which attracts many marine mammals but their numbers have declined for a variety of reasons so I was shocked to hear later that this was possibly to capture them for a sea park. But then, delighted that the plan apparently failed. My Mother wrote to the Jacques Cousteau Society to ask if they had any footage from their trip. They did not reply… but my hope is this rumour is untrue. Even if one has no spirituality there is a sense of awe at being eye to eye with a whale; or watching a dolphin joy ride the waves expressing the bliss of being alive; building ties with a wild elephant that remembers you years later; touching a tree that was alive in 1066 when Norman the Conqueror landed at Hastings; or simply a deep mutual connection with a dog or cat. I feel this deeper connection is where hope for change lies, for we all share it. The appreciation of nature adds value to our lives – and in a world grasping at ‘retail therapy’ for comfort in stressful times it is shown to help reduce stress and boost our health and well being too. Yet the sea is so often described in the disconnected language of a bureaucrat, even scientists have started to use the term “marine resource” or “utility value” and in the realm of politics it is often forgotten that you can’t put a price on the experience of standing bare foot in sea water, lit by the moon as a hump back whale breaches. An economist can assess the tourist value but only a poet can communicate the human experience. Cousteau knew this. Indigenous people know this. Indigenous people across the world (including the Celts and the gaelic speaking people of the Highlands and Islands) who lived off the sea and land, have always observed that everything is connected. They were the original naturalists. The deep interrelatedness was known even before science worked out our dependence on the forests and oceans for the air we breath etc. Our lives are embedded in nature. Indigenous people find it incomprehensible that we would destroy our own home. I have often wondered if western culture’s disconnection from ‘Nature’ which is so often blamed on urbanisation and industrialisation comes from a deeper more psychological root. Perhaps a desire to control the sometimes terrifying wildness of nature and transcend it? A tendency that so often seems to lead to exploitation. Ironic considering so many have shared Thoreau’s sentiments that “Wildness is the preservation of the World.” and by that he meant the preservation of human civilisation. I echo Sylvia Earle, Oceanographer’s comment – “I hope that someday we will find evidence that there is intelligent life among humans on this planet.” Many ordinary people around the world demonstrate the potential for us to rise to meet the challenge ahead – yet we are yet to see intelligent leadership from our politicians. Here is hoping that may change. Well done folks for an interesting and informative Website. A lot of hard work has and is going into your Community drive to protect and improve the Seas around our Coasts. It makes me realise how privileged I was as a Child to be taken out in the Boats Diving with my Father in the early 80’s. At the time I could not appreciate the quantity and diversity of the life around us, I took it for granted. I can see the decline myself, in some areas it is dramatic, in others it is more subtle but it is undeniably a result of our destructive Fishing practices and who knows what effect our poisoning of the Environment is having? All members of the Fishing Community must wake up and realise that a large part of the responsibility for this decline lies with us, we were either responsible for causing it or irresponsible for not speaking out strongly enough to make people stop and think. Government, including the Civil Servants are also to blame for not heeding the many warnings about the consequences of our actions and putting financial gain ahead of protecting the resource. They are after all the people we put in place and support to make the difficult decisions which are sometimes required for the greater good. I wish I could devote more of my time to supporting your efforts but right now I simply do not have it. I promise to do what I can to help. All the best with the plans for the future and again, well done! Sea Change Wester Ross is a local group based around the shores of the Wester Ross Marine Protected Area set up to encourage more local say in the management of inshore waters and our MPA. Over 40 Groups Ask First Minister, Will You Restore Our Seas?